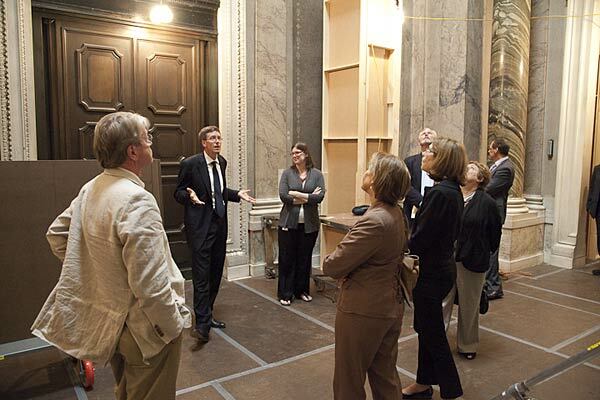 Morgan director William M. Griswold guides a tour of J. Pierpont Morgan’s Library. 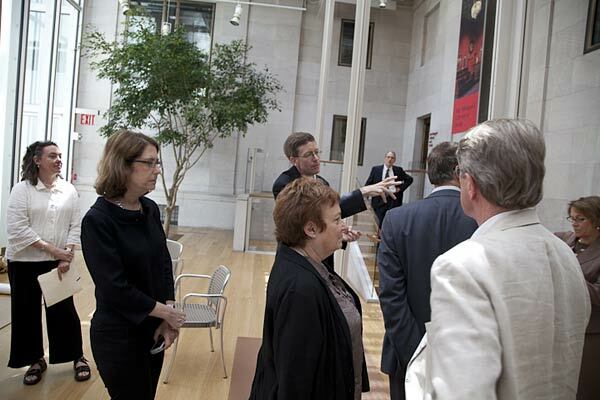 William M. Griswold, former director of the Morgan Library & Museum, recently welcomed fellow directors of nationwide Gilded Age museums for a walk-through of J. Pierpont Morgan’s Library. 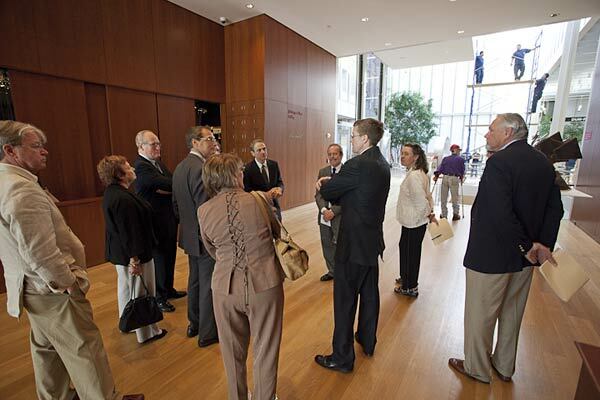 He began his tour by saying, "The McKim building is the heart and soul of the Morgan Library & Museum. Not only does it embody the taste and vision of the museum's founder and patron, Pierpont Morgan, but over the years its beautiful rooms have become synonymous with all that makes the Morgan special. No visit is complete without a tour of the J. Pierpont Morgan’s Library, and now, with this ambitious project and the installation of some of the Morgan's outstanding treasures, that experience will be greatly enhanced." As one of the important buildings of the Gilded Age (the era of great economic and population growth in the U.S. during the late-nineteenth century) in New York, J. Pierpont Morgan’s Library is of substantial interest to architectural historians and other museum professionals. Attendees of Mr. Griswold's tour included directors of the Flagler Museum (Palm Beach, Florida), the Newport Mansions (Newport, Rhode Island), the Vizcaya Museum (Miami, Florida), the Huntington Library (San Marino, California), the Frick Collection (New York, New York), the Taft Museum of Art (Cincinnati, Ohio), and the Walters Art Museum (Baltimore, Maryland). A discussion of the renovation addressed the importance of respecting the ethos of historical spaces, including the need to carry out necessary renovations without impacting the landmarked fabric of a building. "I want a gem," Morgan declared to Charles Follen McKim upon commissioning him in 1902 to build a library adjacent to his residence to store and exhibit the overflowing collection of treasures he had amassed. According to Morgan's biographer and son-in-law, Herbert Satterlee, the basement of the house at the corner of 36th Street and Madison Avenue "became so crowded that it was difficult to get into it and find anything; books, pictures, and manuscripts were piled on the floor, after every table and chair had been filled." McKim was not the first architect that Morgan approached for the project. When he was first contemplating building his library, he contacted Whitney Warren, designer of the New York Yacht Club, who produced an ornate, baroque design. 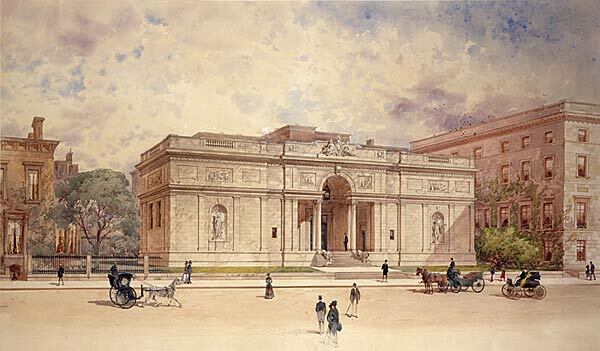 Presumably dissatisfied with Warren's proposal, Morgan opted instead to commission Charles Follen McKim, whose firm, McKim, Mead and White, favored the classical Beaux-Arts style. McKim's design for Morgan's library—the product of "months of study" according to correspondence—is a restrained exterior based on a combination of Italian Renaissance garden casinos and urban palazzi, with an exuberant interior. Constructed of fine, pinkish-white Tennessee marble, McKim's unparalleled library cost approximately $1.2 million at its completion in 1906. In Charles Herbert Reilly's words, "The work of McKim, Mead and White will be found, I think, to be one of the great determining forces in the history of the architecture of our time" (1924). J. Pierpont Morgan’s Library on the Big Screen? Curator William Voelkle recounts that the Morgan declined to allow the East Room of J. Pierpont Morgan’s Library to serve as the setting for a scene in the 1981 movie Ragtime, based on E. L. Doctorow's 1975 novel set in Gilded Age New York circa 1906. Instead, a not-quite-exact replica of the room was made in England. In this replica, while the second level of the East Room walkway incorrectly runs in front of the tapestry, the movie set restored the appearance of the room's now-lost original carved wood doors. Architectural rendering by McKim, Mead and White, ca. 1902. "I want a gem," Morgan declared to Charles Follen McKim upon commissioning him in 1902 to build a library. 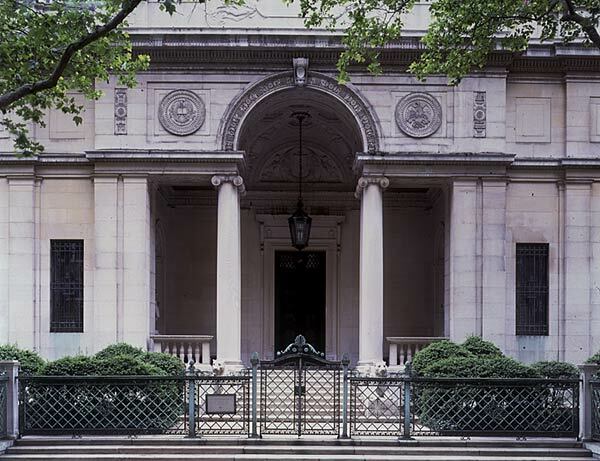 J. Pierpont Morgan’s Library entrance as it appears today. The sleek Assyrian lionesses that guard the stairs (and are currently peeking over the fence) are the work of Edward Clark Potter (1857-1923), who was in the studio of Daniel Chester French. 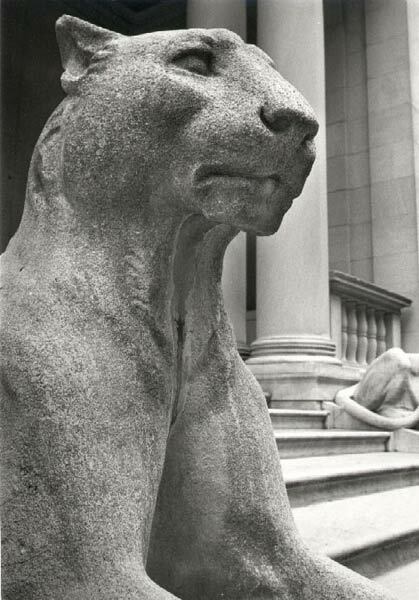 Potter would later create the stately lions that defend the terrace of The New York Public Library. Close-up of an Assyrian lioness. Former Morgan Director William M. Griswold greets fellow directors of nationwide Gilded Age museums for a walk-through of J. Pierpont Morgan’s Library. On the way to J. Pierpont Morgan’s Library, the directors encounter Mark di Suvero, who was in the process of installing his sculptures in the Gilbert Court. 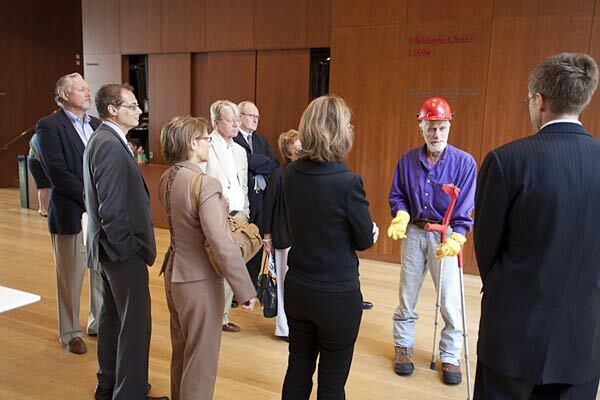 Mr. di Suvero explains how his sculptures came to be at the Morgan. Learn more about our exhibition Mark di Suvero at the Morgan. The directors pause in the Gilbert Court before making their way into J. Pierpont Morgan’s Library. 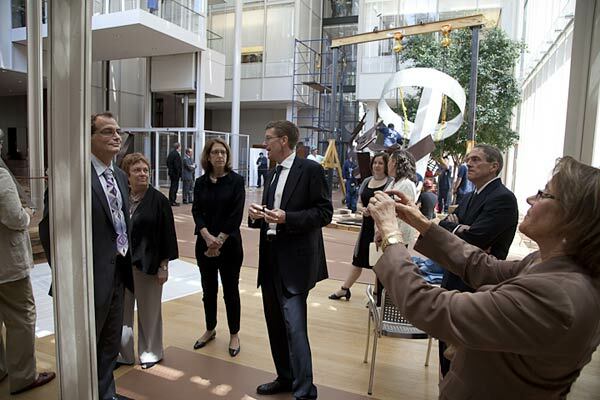 You can see the installation of the Mark di Suvero sculptures (collection courtesy of the artist) in the background. 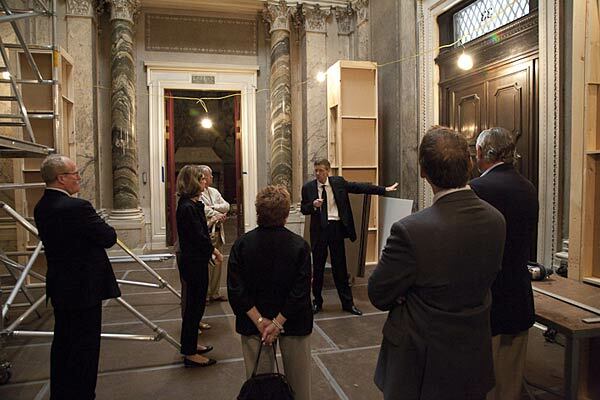 Just before entering the Gilbert Court, Mr. Griswold points out a model of the façade of J. Pierpont Morgan’s Library. 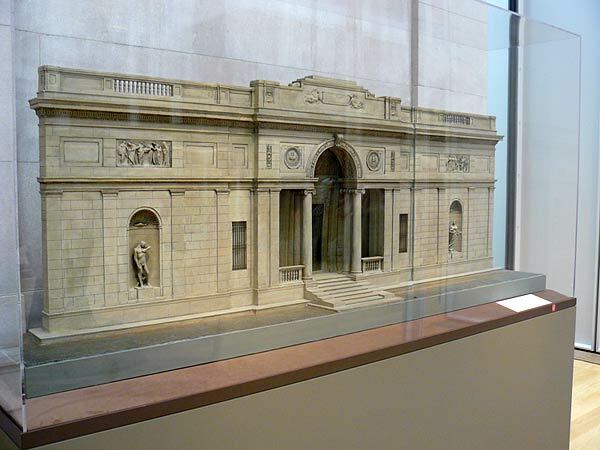 Model of J. Pierpont Morgan’s Library façade. McKim used a classically simple design: a rectangular structure with a recessed portico. Six Doric pilasters on either side establish the rhythm of the façade and disclose the interior organization; the entrance is accentuated by paired double Ionic columns. McKim drew on two sixteenth-century Roman sources for the façade: the attic story of the Nymphaeum (the garden loggia) of the Villa Giulia and the entrance to the Villa Medici. The directors enter J. Pierpont Morgan’s Library, which has been emptied of all art objects and filled with scaffolding and other construction materials. Standing in the Rotunda, Mr. Griswold motions to the wooden doors that served as the original entrance to the library. Our Director explains the importance of carrying out necessary renovations of J. Pierpont Morgan’s Library without affecting its landmarked fabric.